Magnetosome minerals obtained after step 3 are then coated with various substances, such as citric acid, poly-L-lysine, polyethylenimine (PEI), carboxy-methyl-dextran, chitosan, neridronate, oleic acid, etc. (step 4). 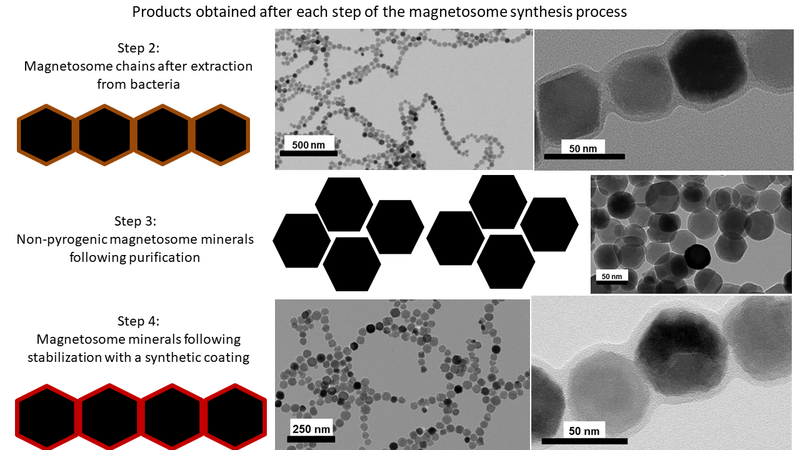 We have shown that coated magnetosome minerals obtained at the end of step 4 are non-pyrogenic, biocompatible, stable in aqueous suspension, and have better heating properties than chemical nanoparticles commonly used for magnetic hyperthermia treatments. Magnetosome minerals covered with a synthetic coating (step 4). Encapsulation in a matrix for the neridronate coating. 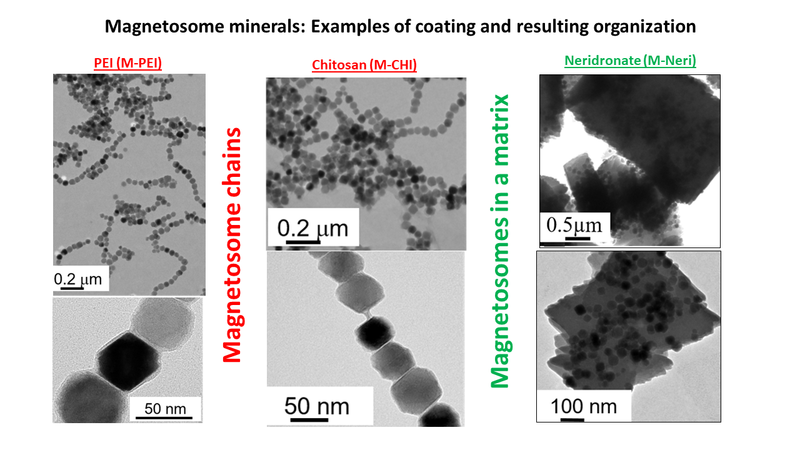 It is interesting to note that, for some coatings, we observed that the chain arrangement was quite similar to that observed inside the magnetotactic bacteria. 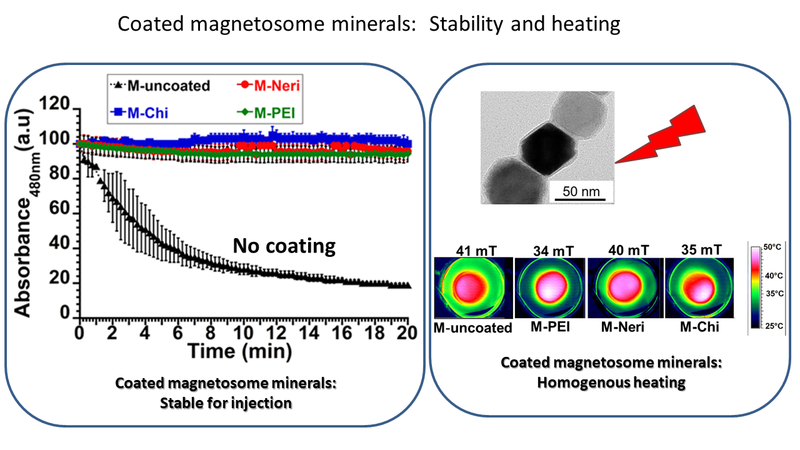 In addition, the figure below indicates that these coated magnetosome minerals are sufficiently stable (>20 minutes) for injection, and that they allow homogeneous heating, meaning they have favorable properties for magnetic hyperthermia. 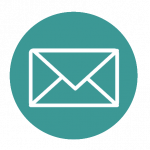 Pyrogenicity-Limulus amebocyte lysate (LAL) tests reveal comparable endotoxin concentrations for coated magnetosome minerals and chemical nanoparticles. In addition, pyrogenicity tests carried out on rabbits revealed that poly-L-lysine-coated magnetosome minerals were pyrogen-free. 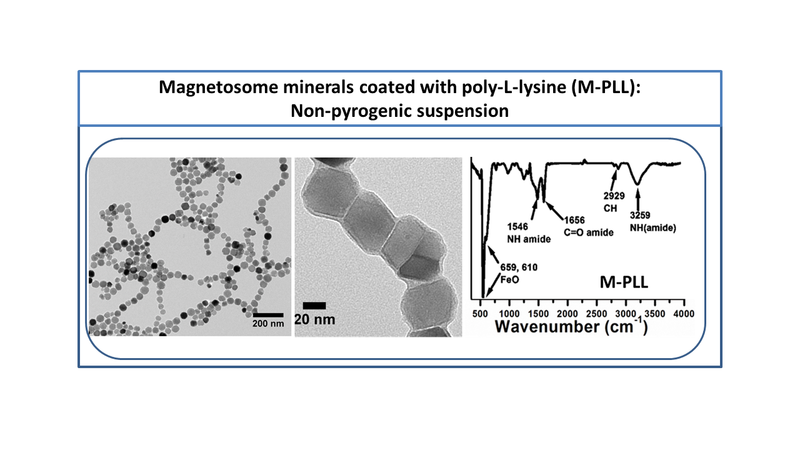 Nanobacterie researchers have also tested the efficacy of poly-L-lysine-coated magnetosome minerals. 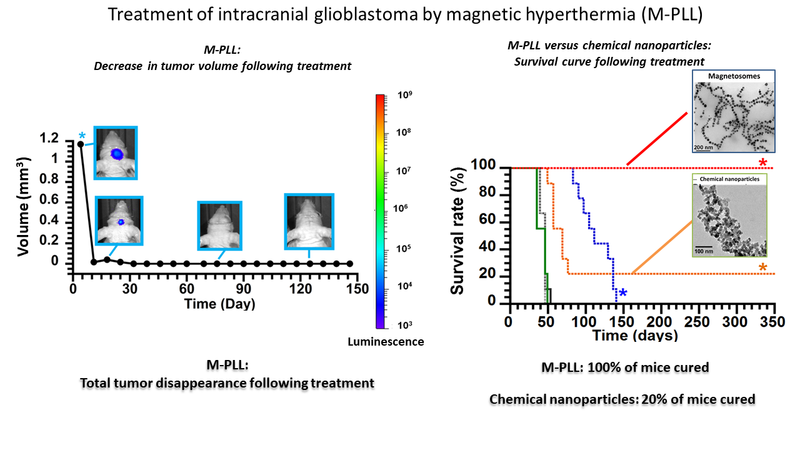 For this purpose, we first implanted glioblastoma GL-261 tumors subcutaneously and, when glioblastomas reached 50–150 mm3, administered approximately 2.5 mg of the magnetosome minerals to the center of these tumors. The tumors were then exposed to 15 applications of an alternating magnetic field of various strengths between 11 and 31 mT and a frequency of 198 kHz to reach heating temperatures of 43–45°C. The treatment led to tumor growth delay in half of the treated mice and to total tumor destruction in the other half. Under equivalent treatment conditions, signs of antitumor activity were much less pronounced with chemical nanoparticles, which yielded total tumor destruction in only 20% of the mice. The figure below (on the left) summarizes the conditions of treatment with poly-L-lysine-coated magnetosome minerals. The other figure (on the right) compares the survival rates obtained with coated magnetosome minerals and chemical nanoparticles. Nanobacterie researchers then grew U87-luc glioblastomas within mouse brains. 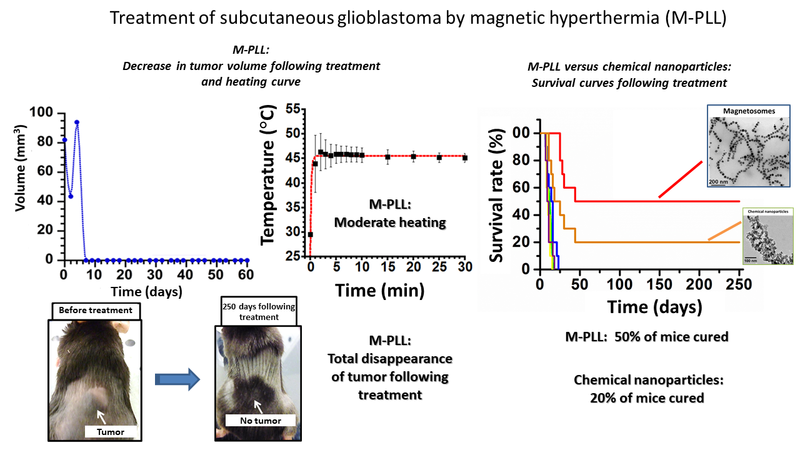 When glioblastomas reached a volume of 1.5 mm3, we administered 0.5–0.7 mg of poly-L-lysine-coated magnetosome minerals to the center of these tumors, and the tumors were exposed to 27 applications of an alternating magnetic field of 27-mT strength and a frequency of 198 kHz. The treatment led to complete destruction of glioblastomas for 100% of treated mice. When carried out under equivalent conditions but using chemical nanoparticles instead of magnetosomes, the treatment was much less efficient, yielding complete tumor destruction in only 20% of the mice. The figure below (on the left) summarizes results following treatment with poly-L-lysine-coated magnetosome minerals. The other figure (on the right) compares the survival rates obtained with coated magnetosome minerals and chemical nanoparticles. © Nanobactérie. All Rights Reserved.